Nematophytes, which literally means "filamentous plants" (Fig.1), are still so poorly understood that lately they have been tentatively listed under the heading "Enigmatic Organisms" . This poses a challenge to look for explanations . Fig.1: Nematophyte in Rhynie chert with nearly parallel tubes in cross-section and two dark clots supposedly consisting of a tangle of much smaller tubes; undescribed species. Width of the picture 1.26mm. - The tubes constituting the nematophyte are rhizoids of some liverwort. of filaments or tubes, belong to ancient liverworts. The idea of a liverwort connection has quickly spread among the scientific community and more or less been accepted without checking, judging from quotations like this: "One interesting hypothesis suggests that several of the enigmatic Cambrian to Devonian fossils traditionally included in the nematophytes may represent remains of ancient liverworts ... ." Apparently this hypothesis has never been seriously doubted, except for the present contribution based on a very few nematophyte specimens recently found in the Rhynie chert . 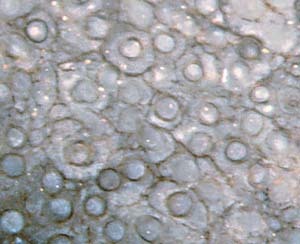 Fig.2: Same sample as Fig.1, with a cellular pattern interpreted here as boundaries between gel coats around the tubes. The problem of how the nematophytes could possibly produce a cuticle with cellular aspect can be separated into two parts: How the pattern is brought about, and how the cuticle is made. 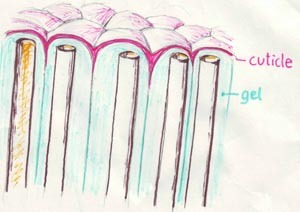 Fig.2 suggests an explanation for the origin of the pattern: Every one of the tubes surrounds itself with a coat of gel. The gel coats taken together make a continuous mass of gel, with the boundaries between them still there and, under favourable conditions, seen as a cellular pattern. It remains to be explained how the pattern can be imprinted onto a cuticle. This is attempted with the drawing in Fig.3. Here it is assumed that the boundaries between the gel coats seen on a cut and polished chert face in Fig.2 make a network of grooves on the surface of the lump of gel, possibly deepened by drying. The tubes may produce a cuticle precursor substance and release it into the gel where it moves by diffusion towards the surface where it accumulates, spreads, fills the grooves, and polymerizes into a protective cuticle with Nematothallus aspect, which is decay-resistant as known from the cuticles of land plants. This is the proposed solution of the long-standing Nematothallus problem, without invoking the idea of a liverwort connection. 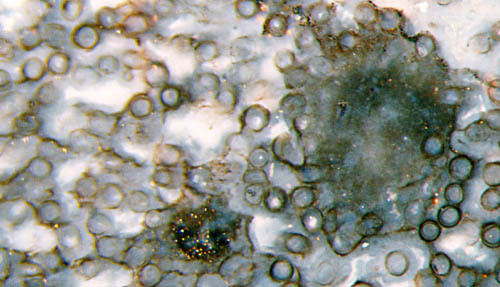 It is essentially based on the presence of gel as a constituent of nematophytes which reveals itself in the Rhynie chert but not with the compressed specimens found elsewhere. A similar solution is proposed for the Cosmochlaina problem. Graham et al. (2010) . 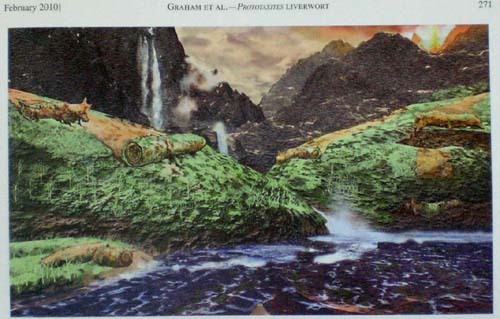 The vanishing evidence for the liverwort interpretation of nematophytes affects the latest fancy hypothesis declaring the enigmatic huge Prototaxites trunks to be rolled-up and subsequently silicified liverwort mats as illustrated in Fig.4 . - The idea of nematophytes being related to liverworts, brought up in 2004 and widely spread since, is not substantiated. interpretation of Prototaxites, might be remembered for its inventiveness but should better be forgotten.